Vancouver has a plan to regulate retail marijuana business. The federal government is voicing its opposition against the motion, saying that could be a leap forward legalization of pot – which is still officially illegal. This plan could bring legalization of marijuana in the city of Vancouver, which already has more lax enforcement of buying and selling the drug. Some locals even dotingly call the city ‘Vansterdam’, the Amsterdam of North America. Vancouver, which could become the first to regulate how and where pot is sold, has 80 dispensaries. Unlicensed dispensaries already operate in Vancouver as well as across Canada, despite the sale of marijuana being illegal. Laws on possession of small quantities of pot can carry a fine or even jail time. However, in Vancouver, which has the strongest support of any Canadian city to legalize cannabis, there is a shady gray area between theory and practice. In April 2014, a new federal law was passed banning medical marijuana users from growing their own, instead setting up licensed vendors. Mandating pot be sold by commercial license producers could be seen as a step towards eventual legalization. Since the law was passed, shops have been popping up around the country, but with a high concentration in Vancouver. “There are now over 80 confirmed marijuana-related businesses in the city operating without a business license and the total number has grown at a rate of 100 percent per year for the past two years,” the document that will go before the council says. The new proposed regulations in Vancouver will require shops to pay the hefty licensing fee of C$30,000 (US$25,000) – which is modeled after Colorado’s and Washington’s system in the US. Aside from a steep licensing fee, regulations would ban dispensaries within 300 meters of schools and community centers, as well as within 300 meters of another dispensary. Before Vancouver can continue with its ambition to legalize cannabis, it must battle a staunch opponent in the Ministry of Health. “Storefront dispensaries are not part of the Health Canada regime in any way,” she said. “What they are is commercial entities selling pot on street corners,” Federal Health Minister Rona Ambrose said in an interview on Friday. Specifics on the regulation will be discussed in detail this week at Vancouver’s City Council. In North America marijuana is currently legal in the US states Colorado, Oregon, Washington, Alaska, and the District of Columbia. Twenty-three states, as well as Washington DC and Guam, sanction medical marijuana. 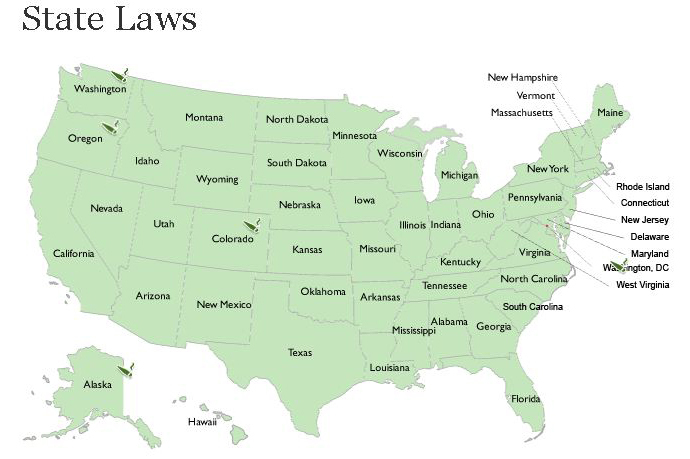 Under America’s federal laws, however, marijuana is still considered illegal. On April 20, known as a holiday amongst stoners, thousands gathered across Canadian cities, calling for the legislation of marijuana and easing of cannabis policy.